My latest drawing was quite a bit of work but now I am happy how it turned out. It is part of my homework for the Leonardo Art Academy. 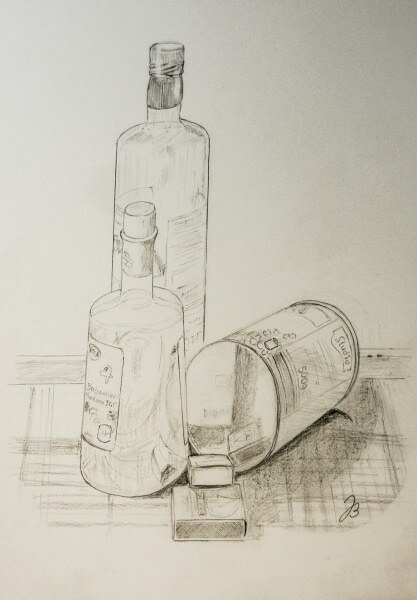 The assignment was a still life with two bottles, one can and two matchboxes. I took my oil and vinegar bottles, an empty peanut can, and two matchboxes with a Spar logo. I did learn from past experience, to use artificial light, because this does not change during the day. I was not quite prepared that I had so many reflections, both on the bottle and the tin. In the end, that was the fun part. You can even see the reflection of my drawing pad in one bottle. This drawing is also part of the 30in30 Challenge with Leslie Saeta. Due to the homework, I decided to do mostly pencil and ink drawings during this challenge.